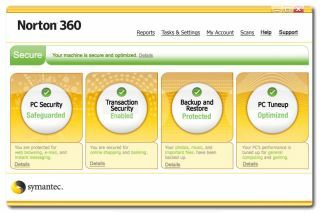 Symantec has launched its combined internet security and PC maintenance application, Norton 360. The suite combines Norton's Internet Security software with tools to back up your system and clear it out. The price for a year's subscription is £60. As with other manufacturer's products, you can buy boxed copies or subscribe and download online. Kevin Hogan, senior manager for Symantec Security Response visited Tech.co.uk to outline some of the improvements with the new software. "We've often been criticised for slowing down the PC with our software. This time we've really focused on performance. Two running processes now take up less than 10MB of system memory." The package includes 2GB of integrated online backup, and only works during idle time so it won't interrupt your other work. The software is fully compatible with Windows Vista .